The forming of Torture Killer was mainly inspired by Six Feet Under. Even though they tried to form their own style, they didn't go far from their main influence and kept playing groovy death metal. The main features remained, but the imaginations and songwriting abilities of Torture Killer showed more diversity that their masters did. The lyrics also went sometimes further than the narrating listing of synonyms vs very simple and immature lyrics that were so common at Six Feet Under. "For Maggots to Devour" sounds more insane and authentic the same time. That's because they always payed attention to keep a certain level of intensiveness to not collapse into some retired monotone speed and repetition. The debut also includes the starting push of a young band. That's responsible for the intensity they strated with and for their raw themes that were piled up in the second part of the album. Some sort of black, grotesque humor is also hiding behind their musical expression of dissection, mutilation, butchery and insanity. Altogether "Maggots to Devour" was a stunning and promising start that gave a new shade to the groovy style of death. Revenge just picked up the line where Conqueror dropped it. James Read was the common point in both bands and that explains the similarities and the direct influence. The band proved to be more persevere and more productive than Conqueror was. 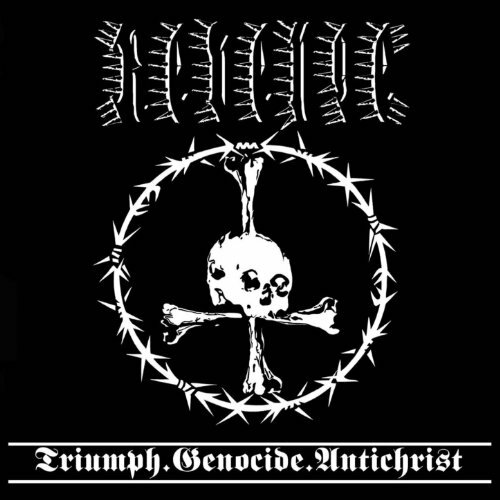 "Triump.Genocide.Antichrist" was their first full-lenght album, but they released already two EP's before as a worthy introduction. 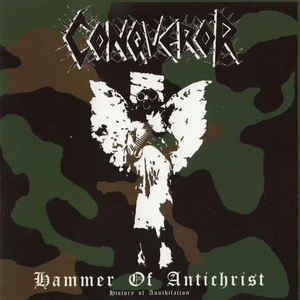 The similarities with Conqueror in the cover arts and the music are not accidental, it's exactly the same concept: pure satanic madness about war, destruction and anti-Christianity. Still there are some mentionable differences. Even though Revenge was the same insane, their song structures were less chaotic by sometimes showing some well composed themes. There are also some frequently returning middle speed slow-downs too with more black metal-like vocal style. That sounds like an old school reference and made their music a little bit more diverse and more enjoyable. Except that it's again the endlessly exaggerated brutality on the line on Blasphemy, just how like black/death metal should sound like. No dark beauty or aesthetical masturbation should be expected. For those who missed Blasphemy, the appearence of Conqueror could have been satisfying. The band was formed by their guitarist Ryan Förster and James Read, and that's already enough to guarantee the expected quality. Anyway this band wasn't a long living project and so active neither. "Hammer of the Antichrist" was a compilation that summarized their discography including their one and only full-lenght album and their demo releases. So it's a nice lenght for long term enjoyment. The same insane feeling returned in their music like in Blasphemy a decade earlier. 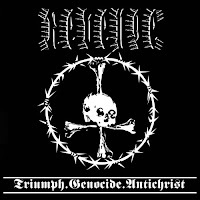 The difference is that Conqueror sounds even more intense and the vocal style is closer to ordinary black metal. Just like the most exaggerated direction of black/death, Conqueror's music completely lacked atmosphere, melancholy, melodies and any aesthetical features. It's raw, compromise-less noise about war, apocalypse, satanism and hatred mostly in rehearsal quality. And like usually in this style, the primitive sound puts the raw brutality in main focus, that is exactly why this style could be preferred. Strongly recommended for he fans of blasphemous musickness. Thrash metal was forced to take a back seat since a while, but fortunately some newer reinforcements came from time to time to refresh the scene. One of them was E-Force from French Canada. Their intense debut summoned a feeling that was missed since a long while from the main scene. They sounded a bit different compared to old school thrash, because some modern influences also could be sensed in their music, but it still had the needed nostalgic characteristics. Probably the softer kind of thrash and the Bay Area scene was also between their influences such as the more aggressive direction. The improved features are that they tried to substitute the typical softer themes and yowling vocal style of the first one with something more actual. In the early '00s it's was hardly possible to reach any serious impression with the musical toolbar of the '80s, so some modernization was needed. That they performed creatively by their own way, and that made their music more colorful than usual. By the lyrical themes they followed the classical tone and topics of the genre. 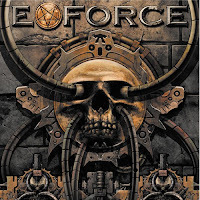 "Evil Forces" was a reinterpretation of an old school style that didn't run down only by intense thrashing, but also had some renewing ambitions. It's always nice to see bands who didn't give up playing even after decades without a full-length album release. Derkéta haunted the underground scene since the late '80s, and after some lineup changes and longer inactive periods they have returned again in 1999. "Goddess of Death" is a compilation that includes their demo recordings and the songs of their split album releases. They introduced an alternative aspect of death/doom metal that sounds somehow similar to Cianide. They also tried to reach the heaviest depths in sound and build on the contrast of slow themes and sudden speed ups. Derkéta is different on one hand because they seemed like to enjoy chaos by operating with suddenly came hammerings more often, and to involve different themes to turn their songs diverse. Without connecting these themes together this made their songs more raw than how it's usual in death/doom. The other reason is why they were different is that they more or less preferred female lineup. That was quite extraodinary back then, especially in this style. This could have been also responsible for their experimenting ambitions, because they tried to express themselves from an emotional aspect in a style that rarely bulids on emotions. Still they've reached a remarkable level of conveying an unfriendly impression. There are plenty of enjoyable heavy themes to find on the compilation, and the rehearsal quality increases their effectiveness by it's dirty sound. Strongly recommended for the fans of dark and raw hopelessness. Almost a decade had to pass eventless, without any high quality underground material in the very small Hungarian metal scene that didn't produce anything interesting meanwhile but cheezy heavy- and teen metal. Fortunately Depths of Depravity broke that homely tradition by "Into the Decay" that counted as something extraordinary regionally too. 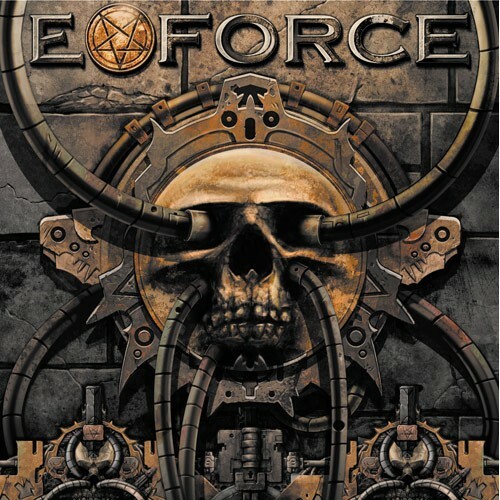 Influenced by the modern sound of technical brutal death metal (mainly by Suffocation) they proved that it's possible to keep up with the main scene even in almost metal-less areas. The reason how a debut can be so stunning in a so complex style probably also lies in the musical past of the band members, because they played together since the mid '90s under a different name. This album was also one of the the most brutal ones of the local scene by it's heavy sound, exaggerated and compromise-less themes and sudden changes. Not to mention the insane and animalistic vocal style that was also something new to hear around. The album is well composed even though it sounds very chaotic and it's definitely not easy to go into. The bass lines are very intense and well heard so they took also an important and enjoyable role in the composition of chaos. If the listener hopes to find any catchy melodies that could be whistled on chilling weekend afternoons after a well filling lunch, it gets clear very soon that these hopes will have to shooed away fast. 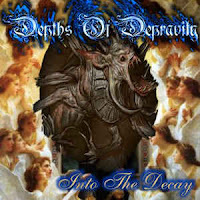 It's took for a long time still until the local scene went through remarkable changes, but the appearence of Depths of Depravity counted as a very promising omen. 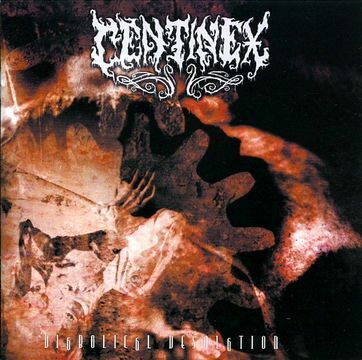 As one of the earliest Swedish death metal bands, Centinex strenghtened the local scene since the early '90s. By always showing up with high quality records, they never disappointed the fans of the Northern style of death. Even though the quality of their music didn't change during the decades, their style did, probably because of the line-up changes. From the late '90s the thrash influences had more focus in their music than on their older very heavy albums like on "Malleus Maleficarum". On the side of the speed-up, the heaviness of the sound and the different, cawing-like vocal style supported the even more old school feeling. On "Diabolical Desolation" they went a bit further by involving more '80s references. Even some very nostalgic heavy metal melodies could be found. This step was also a good example of the old school tendencies of the Swedish underground scene. While the rest of the world tried to find a new, modern sound and path, they turned back to the very basic roots of metal. Even though the late style of Centinex still counts as old school death metal, they preferred to dance to mosh around the borders of metal genres, that made their music colorful and more enjoyable. 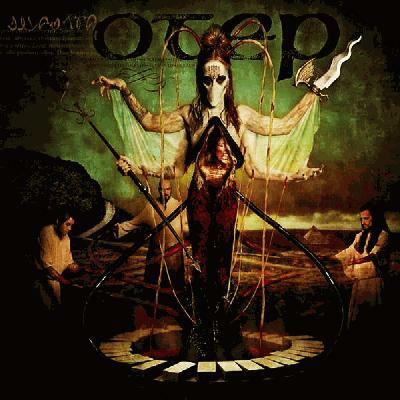 Otep appeared as something special from the mass of nu metal bands. Their debut EP "Jihad" sounded very promising and introduced wider musical diversity during it's 15 mins than most other bands on a full-lenght record. But sadly in full-lenght version they didn't seem much different either. For this the extented passive suffering parts are mainly responsible, because compared to "Jihad" these took away a lot from the intensity of the album. The slow downs were needed to illustrate the inner torment of personal issues. But unlike at other bands in this style, these problems having a bit more serious ground, like childhood abuse and memories of being raped. But there is a something in common too with the heavier groups: they also had a very sick and nerve-racking song at the end of the album. The main concept of the band and their lyrical/performance style strongly reminded to Crisis, but Otep was a weaker and more generic production of course. And Miss Shamaya couldn't even reach Karyn's voice of range. She made her performance colorful by rapping, screaming, clear singing occasionally, and "growling". It's nice how nu metal and metalcore/deathcore frontmans covering their microphone with their hands to make it easier to growl, but unfortunately it's lame, and that's not what growling is about. Except these smaller "aesthetical issues", the band's full-lenght debut still belongs to the more genuine nu metal albums. 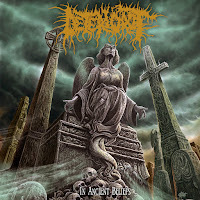 Even though Deteriorot was formed in the golden age od death metal, it took a decade to release their full-lenght debut. Similar to other bands in the same situation, the album includes the songs they've write during the '90s. Most of their songs appeared on their early demo tapes and EP's. Therefore "In Ancient Beliefs" is an authentic old school death metal album that brought back the nostalgic feeling of the early '90s. Their style showed plenty of similarities with Incantation, so it's very heavy, and often operates with the mix of doom-like slow downs and intense brutality. This shows the same raw aggressiveness and endlessly dark aspect, and the anti-Christian and occult lyrical topics also referring back to the masters of blasphemic insanity. Still Deteriorot's music is audience frendlier by the common ordinary old school themes, that are pulling the listener back from the chaos. They've put some short catchy into their songs from time to time, so it's not merging completely into the swamp of putridness. These various changes made "In Ancient Beliefs" more diverse according to it's heavy style of death metal. Until the early '00s the newer styles of death metal almost completely wiped out the existence of the old school sound from the memory of the main audience. But occasionally some bands showed up to refresh the memory of those who were not so satisfied with the progressive, brutal, technical or melodic directions. 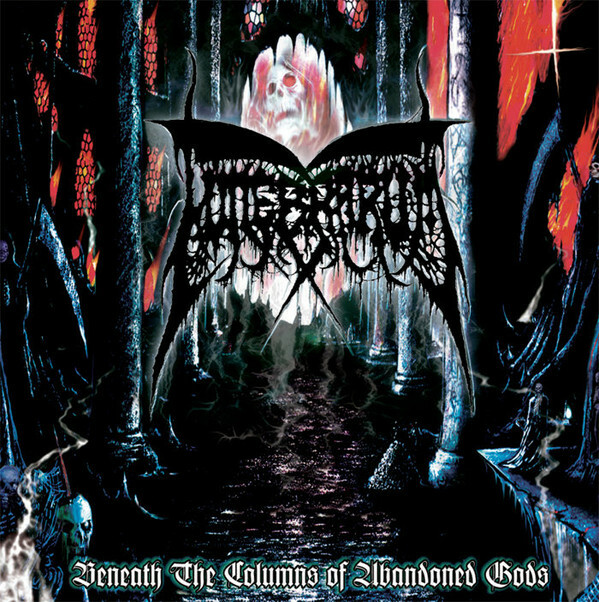 Funebrarum was one of the few bands who played excellent cryptic stenched death metal in the early '00s. Their debut was an all-round high quality record, similar music was extremely rare to find in those times. Even though the putrid sound had absolute role in their music, it was also a little bit more than old school death metal. Their slower and middle speed themes presumed some doom inflences too. And by checking the line-up, it's not surprising, since two of their members played in Evoken too meanwhile. If it's about influences, their music reminding of Autopsy and the Swedish style of death metal. The simple but catchy themes of Carnage, old Entombed and Grave waving back from the forgotten past, commonly interrupted by intense and noisy hammering parts. The lyrics also returned to the classic topics of death and torment just like in the "good old times". "Beneath the Columns of Abandoned Gods" wasn't only some nostalgia album, but an authentic proof that death still walks among us.